Before uploading or sharing your videos, edit them using Cyberlink Action Director Software which is specifically designed for your Gear 360 camera. ActionDirector provides editing functions such as stitching, trimming, adding titles and creating transitions in your videos - and the best part is, it comes free for all Gear 360 owners. Download Gear 360 ActionDirector for PC or Mac. 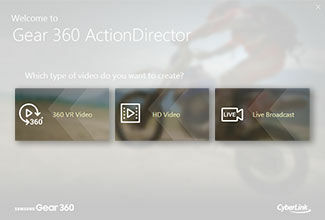 1 On your PC, double-click on Gear 360 ActionDirector. • 360 VR Video: Import 360° videos, add 360° effects, and then upload to a social platform that supports 360° videos. • HD Video: Import 2D videos from the Gear 360 or your mobile device and then edit them. • Live Broadcast: Broadcast videos from your Gear 360 camera live to Facebook, YouTube, or Samsung VR. 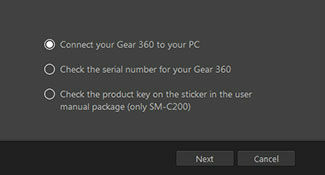 3 To activate ActionDirector, you can either connect the Gear 360 to the PC or enter the serial number located on the sticker under the camera status screen. Select the desired method and then click on Next. 4 When the activation is complete, click on OK.
5 Review the information on the CyberLink Product Improvement Program, select whether or not you would like to participate, and then click on Close. 6 Register your Gear 360 ActionDirector to receive exclusive benefits. You can also skip the registration and complete it at another time. 7 Click on OK and now you're ready to use ActionDirector. • Introducing Gear 360 ActionDirector. • Importing videos using Gear 360 ActionDirector. • Basic editing functions of Gear 360 ActionDirector. • Adding titles using Gear 360 ActionDirector. • Exporting 360° videos using Gear 360 ActionDirector.